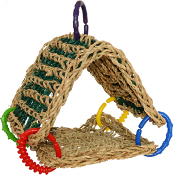 This activity center provides hours of fun for small birds. Made from tough sisal that is wound around a steel form a fun sphere. Birds can perch, preen and swing. Acrylic chains add an alternate material for chewing. Bell is easily reachable inside the sphere. Measures 7" diamter and 13" high. Made by Caitec/ Paradise Bird Toys.